When Swimming In A Crowded Lane | Mediterra - Swim & Run Better Than Ever! An ideal swim training situation is to be either in a lane by yourself, or training with others in the same practice sets. But there is the situation, probably more common for some folks than others, where your only option is to share a lane with many other people, each with their own (uncoordinated) agenda. I was in such a situation recently while hanging out with TI Coach Helga in Amsterdam. I contacted her for a swim, and she invited me to the 5:30 pm lap swim time as our only real (indoor) option that evening. There was just this one hour after work and it seemed the whole neighborhood came to the pool. Out of 6 lanes, just one was left to freestyle swimmers, and at any given moment in the hour there may have been up to 7 people cycling around that 25 m lane. If it were 7 swimmers on the same team, doing the same workout, that would be one thing – but 7 random people doing their own thing was a bit nuts. Somehow I was able to squeeze among the fast and slow swimmers to get in a bit more than a 1000 m swim. While I was doing it I was pondering how one would adapt to such a situation if this was the only option for swimming each day. For myself, I was already feeling somewhat deeply fatigued after a wonderful week at our open water swim camp in Kaş Turkey. I did not have a particular agenda but to fall into a nice rhythm, loosen up and flush out my system after my flights from Turkey that morning. But even that simple objective was hindered by the crowd in the lane. I could sense being squished on one lap and then feel space open up on the next. For example, one guy was plowing his way aggressively down the lane (and picture a plow tearing up the water!) while another gal was more gently pulling along (picture her busy kick but still not going very fast). I could sense him creeping up on my toes while bubbles from her feet ahead were filling the water in front of my eyes. No one seemed bothered or upset so I assumed this was lap-swim-as-usual with the Amsterdamers. This faster guy would slip into the middle and cruise past and somehow kept from smacking into anyone. I could tell only one or two of the people in the lane had some swim team experience for they were the only ones who knew where and how to pass, how to turn or stop in the right spot at the wall to make it easier to swim in a crowded lane. The others did not have the same courtesy but I realized they would not necessarily know these things. Once I noticed Coach Helga had stopped, I joined her sitting on the side of the pool, and together watched the chaos for a while and wondered how those folks deal with this situation each day. But what would I do if this were me? If there is just an hour available, I can’t wait for people to clear out. First, I would identify what I cannot control: the number people; the spacing between them; the various speeds for each of those people. In other words, the speed I can go on each length is going to be random, with or without the possibility to pass, and sometimes having to stop at the wall to let someone else pass me. Doing a pre-designed practice with certain SPL or times, or rest intervals is not going to work. Then I would identify what I can control. I can use that randomness as a training challenge in itself. Each length gives me a new scenario to adapt to. I could speed up to stay on a fast swimmer’s toes. I could slow down to stay in the draft of a slower swimmer, and wait for the moment to sprint around. I could use a Tempo Trainer at a fixed tempo which would require me to change speed only by changing stroke length and stroke pressure. At some times during the swim I may be swimming with more intensity, and at others with less. So my effort and rest would be more randomly assigned. I would speed up for a while and sustain it to extend the time I could swim without interruption and then practice resting when the next opportunity presented itself by coming up on a slower swimmer. I would always use a set of focal points that will help me adapt speed and stay peaceful in the midst of the disorder. This would be an exercise in adaptation to a fairly random, pressure-filled environment. 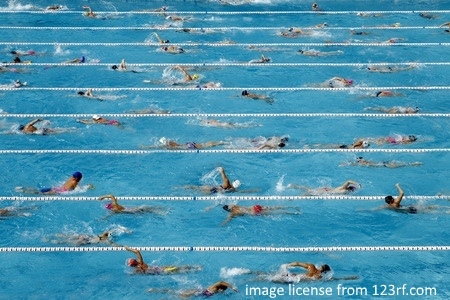 It would provide an opportunity to apply deeper internal order when there is more external chaos created by a lane full of uncoordinated swimmers. How would you adapt and make the most out of a crowded lane? If you’d like more on this topic you may view Courtesy In A Crowded Lane.